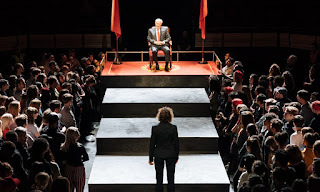 The Guardian publishes as good a review as anyone would want to read on the Shakespeare play that recently played at the Bridge Theatre in London. I knew that the play was going to be introduced by a rock concert. I didn't realize that it would be 10 minutes of rock concert. Too late to run when I saw that, so I settled in to enjoy the music and the play. David Calder as Julius Caesar in the Bridge theatre production. Usually I count on Rebecca to have seen the show, but knowing she is at a conference in London, Ontario, I think there is no one who might have seen it. Still I want to say a few words. I didn't used to like the old plays being brought forward, performed in another century even. Nor did I like having women play men's parts and vice versa. A bit of a purist in me. I will say that giving up those old feelings and letting that suspension of disbelief take over was overwhelming. 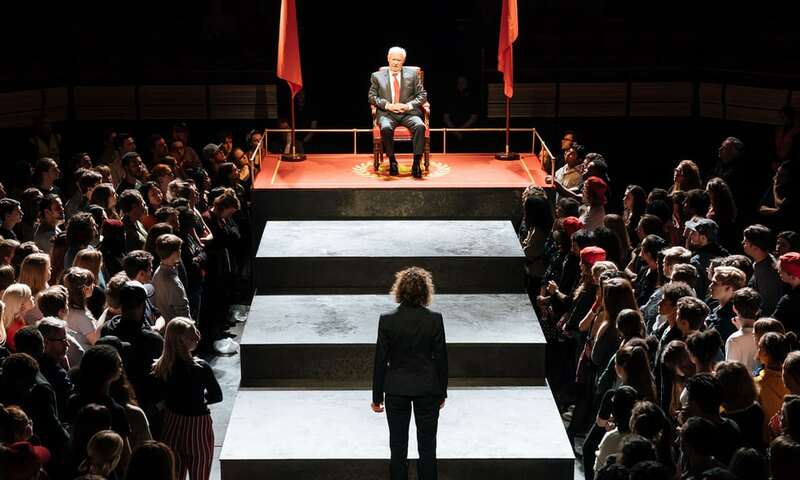 I did read that the critiques didn't really like this play, but ticket sales were sold out -- a wonderful irony given that the play deals with ideological differences between the elite and the populace. Well, having never used the word populace in a stentence, I back off or maybe back up. 1. I liked the rock concert beginning and wished that Duncan and Alex had been there, popcorn, drinks and candy in hand. I counted up the number of people in the theatre. Under 25. The younger well over 50. 2. Cassius whom I let enter my heart guardedly, stole the show. 3. When the red billowing silk/parachute like fabric covered the audience and then was brought away to reveal a new stage? Oh, that was a moment to remember. 4. I liked seeing the faces of the people in "the stalls", though who knew they could stand for 2 hours and be part of the play as well. Fantastic! 5. NT Live brings those exquisite close-ups to us just the right lines. Oh to the beauty of shots we call the extreme close-up. 6. How about the strobe-lighting, the balloons descending, the assassination scene (chilling? frightening?). Guns make me nervous. I see that the show is replayed in some vicinities on May 16th. I might see if it comes back here there.